ST. GEORGE — One man seriously injured in a three vehicle collision on Interstate 15 in Beaver County Friday was flown to a St. George hospital while his father, who was also injured in the crash, was transported by ambulance to a different facility. 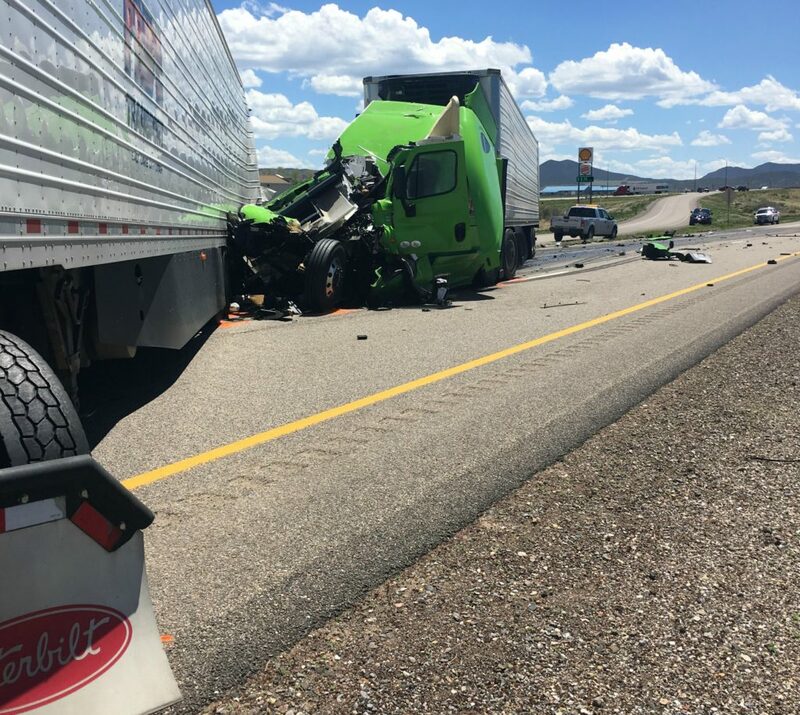 Shortly after noon, a multivehicle crash was reported just south of Beaver on I-15 northbound near milepost 109 involving a pickup truck pulling a camp trailer and two semi-tractor trailer trucks, Utah Highway Patrol Sgt. Jacob Cox said. Traffic was already congested from another crash reported at mile marker 110 when the second crash occurred. Upon arrival officers closed both northbound lanes of the interstate and diverted traffic onto state Route 160 through Beaver, Cox said. The closure was needed in order to clear debris on the roadway and provide an area for an Intermountain Life Flight helicopter that was en route to safely land. A pickup truck pulling a camp trailer and a gray Pride semi were traveling in the right lane at either a reduced speed or were close to being stopped in traffic because of the first crash, according to a UHP news release. 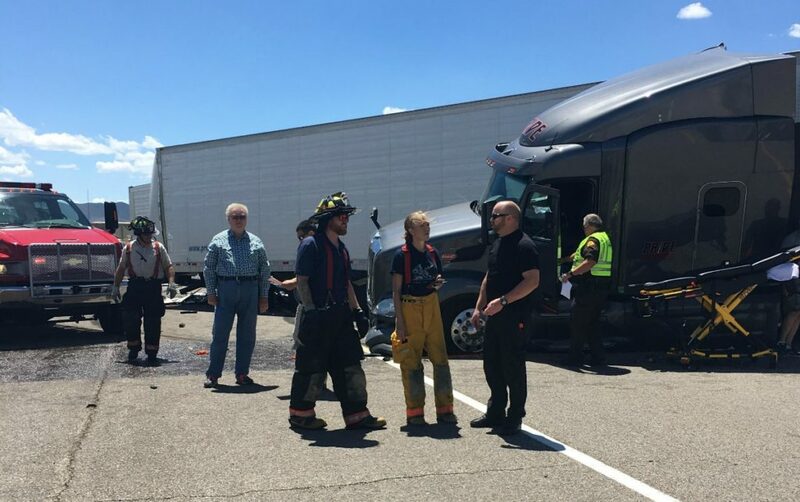 The driver of a second semi, a green Well transport semi, did not slow for the congestion and drove into the back of the Pride semi at 65 mph, the release states. The impact pushed the cab of the Wells semi into the Pride semi. Responding troopers found the driver of the Wells semi on the ground, but it was unknown if the man was ejected or climbed out of the truck after the crash. The driver told officers his adult son was still inside the cab of the truck that was now wedged into the trailer of the second semi. Troopers were able to locate the driver’s trapped son but could only reach his arm, which he was able to move in response to their questions. Beaver County Sheriff’s Deputy Lonnie Laws, who is also an EMT, climbed into the semi to render aid. The deputy held the man’s hand to comfort him while responders worked to extricate him from the wreckage. Law stayed with the man until firefighters were able to free him from the wreckage. Due to his significant injuries he was flown to Dixie Regional Medical Center in St. George while the driver was transported to Beaver Valley Hospital by ambulance. “We are still trying to determine how fast the Well semi was going when he struck the second semi, so the investigation into the crash is ongoing,” Cox said. The trooper also explained that it is commonplace for officers to comfort crash victims while firefighters or EMS are still en route since many times they are the first to arrive at the scene. “They are injured, and particularly when they are trapped they feel alone, and sometimes it takes a little time to extricate them so we stay with them,” Cox said. Giving the victim comfort and telling them to focus on the trooper’s voice helps them to remain calm, which reduces the risk of them going into shock, which can be dangerous, he said. Numerous agencies responded and tended to the crash including the Utah Highway Patrol, Beaver County Sheriff’s Office, Beaver County Fire District, Intermountain Life Flight and others. Both northbound lanes were reopened for traffic at 3:30 p.m., while the on-ramp at 109 remained closed. No other information was available at the time of this report. I was passing a line up of semi’s today on I-15. I usually try to pass them as quick as possible so as to not get boxed in. Checked my mirrors and looked like I had plenty of space in the fast lane to change lanes and overtake. I’m doin’ about ninety passing the lineup of semi’s. Next thing I know there’s a car about two feet off my rear end. Frickin idiot must’ve blasted up behind me doing over 100 to be on me that quick and on top of that felt the need to tailgate me extremely close at 90. I really don’t know where these idiots learn to drive. Moved over to the next lane as quick as possible after i passed the trucks, and I guess the frickin clown zipped back up to 100mph quick as hell, because he was out of sight very quickly. I just hope the clown crashes and burns by himself before he takes down other drivers in the process. Bottom line: people think this recent speed limit increase to 80mph is a license to drive like fricken clowns.